Change has been on my mind lately. It reminds me of the popular quip my ex-colleagues and I have thrown about freely: "The only thing constant is change." We were then talking about changes in our work responsibilities, our reporting structure, our job titles, even our company names. Working in a high-technology industry, one has to learn to expect the unexpected, where it is not the big that swallow the small, but the fast that outruns the rest. In the past few years, I have seen big companies like Nortel, Citibank, Barings Bank, Worldcom, Enron, AIG, and many other companies that have failed to change with the times. In the mobile phones sector, Nokia and Ericsson are increasingly overshadowed by Samsung and Apple. In the Internet search business, Google has monopolized the search market, leaving Yahoo and other search engines to battle for a distant second. In software, Microsoft Office is under increasing threat from companies that are offering lots of software free on the web. Even the venerable lady of the Internet, the ubiquitous EMAIL is being challenged by social media. Change is here to stay. The law of the jungle remains very applicable to our modern world of competition and lifestyle. Those who do not change or adapt will fade away into oblivion. During my recent visit to the Far East, I had the opportunity to reconnect with family and friends. It brings back good memories and fun of yesteryear. Of course, I took the time to savour the local delicacies. Even as I ate and enjoyed the different selections of food, I cannot help but notice the aging workforce in some of the most popular eating places. In fact, one famous braised duck restaurant in Singapore will be closing this coming June. Some other hawkers are lamenting the lack of interest from the younger generation to take over their business. The threat of old recipes and famous food stores disappearing from the food scene is a real thing. No apprentices. No future generations. No more good food. If there is no concrete steps to address the lack of manpower and to train the next generation of cooks and chefs, the food that we enjoy now, will gradually disappear, as far as quality and taste is concerned. Like the business world, if the food industry does not recognize this quickly, the famous food that we praise so much will soon be history. This one thing is most true. 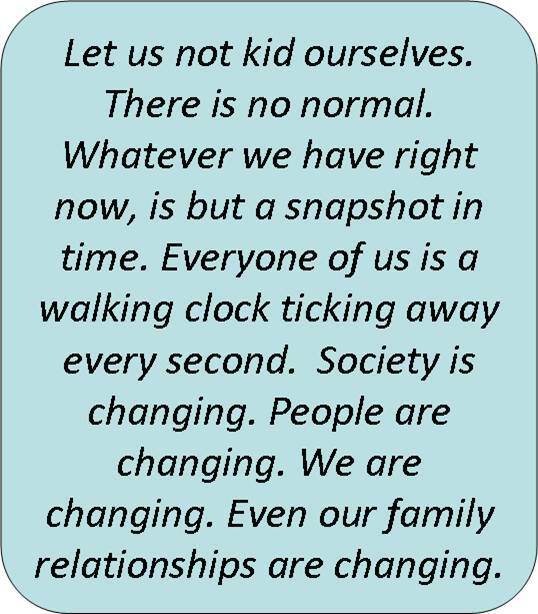 Change is happening all the time. There is no normal. Only constant changes. Let us not kid ourselves. There is no normal. Whatever we have right now, is but a snapshot in time. Everyone of us is a walking clock ticking away every second. Societ:y is changing. People are changing. We are changing. Even our family relationships are changing. Last week, I wrote in my Facebook account: "It is not teens who are struggling in their growing phases, but also parents who fail to grow up in their perception of their kids. Parents need to grow up too." When I meet people I know, especially my peers who are also parents, we often say to one another about our kids: "Wow! Your child has grown so much." Looking back, I wonder why we make such comments. Do we really expect kids to remain kids after 10 years? Do we expect them to have the same rounded face or chubby look from years ago? Are we seriously out of touch with the next generation? Sadly, we are. We have often failed to grow up with our children. The very remark about how much they have grown is one stark evidence of how much we have not noticed our children. Almost ten years ago, I said goodbye to hot and humid Singapore and Malaysia, and hello to cool and rainy Vancouver Canada. My kids were unhappy about being uprooted from their comfort zones. My wife and I were quite nervous about having to leave our comfort zones and to embark on a whole new adventure in a foreign land. Looking back at the ten years, I must say that what we have lost in terms of financial and opportunity costs, we gain in terms of seeing our children grow up during their formative years. We eat meals together very often. Both my wife and I take turns to cook for the whole family. Even though some evening meals, we talk relatively little, the very presence of one another make a difference. We notice one another. When our oldest daughter moved out last year to live on the University campus, the first three months prove to be hard to pass. We miss having everyone eating together during the all-important family meal. 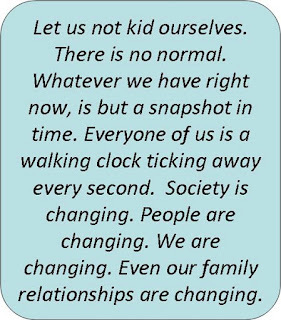 We are all changing, whether we like it or not, know it or not, realize it or not. The only constant thing is change. There is no such thing as normal. Only new things that are happening every minute and every second. The "normal" that we used to know is only accessible through our shared memories and common experiences. Normal is an illusion. When we fail to adapt or to change, we are hanging on to the "Good Old Days" illusion that is not constructive, but also destructive. Qohelet wisely observes the importance not to be trapped by the kind of nostalgia that inhibits present living. He says that it is "not wise" to ask questions like these. Why is it not wise? Let me offer up three reasons why. First, it keeps us stuck in the past. One of the things that I have noticed in many church communities is the constant argument over traditional vs contemporary worship. The older ones like hymns or the familiar songs of the past. The younger ones desire the latest hip-hop style or loud choruses that appeal to the vigour of youth. What some older people are forgetting is this. They used to be young, and they too choose songs that are noticeably different from their predecessors. As long as we are stuck in the past, we will not be able to see clearly the needs of the present. Second, is it really true that "old" is better than the present? We live in a generation where scientific advancement and technological progress is increasingly expected and demanded. Within a span of weeks, the latest and the greatest gadgets can be rendered obsolete. Just look at how quickly Hewlett-Packard abandoned their tablet project, the TouchPad, and left the business totally. Also see how the mighty Apple company is struggling to contain the Samsung onslaught of newer and sexier phones. For a generation such as these, "old" is more of a liability. Thus, anyone who claims the old is better than the new will not only be laughed at, he will also not be taken seriously. Third, life is temporal. The "old days" in the past or the "new days" of the world we know, will soon be gone, and replaced by newer things and newer days. We can only look forward. Nostalgia is good for a while, but we need to snap out of it quickly so that we can start living in the present. Better still, live and anticipate the future. Christians are in a great position when anticipating the future. There is no normal, only new hope to come. Our faith cannot be normal. We cannot be stuck in memories of the past. We need to grow and live more like Christ. We need to be freed from unhealthy nostalgia, and liberated to claim the promises of God as taught in the Bible. Change is the only constant. For there is no normal. We change. There is only One who does not change. God. That is why God is our constant Guide, our faithful One, our everlasting Lord. Do not look back at the "old days" and call it "good." Look to God, the Author and Finisher of all our faith, and call out: "Come Lord Jesus! Come!" Yes, God's mercy is new every morning. Let God's faithfulness, fill our hearts with hopes afresh, anew, and ablaze.